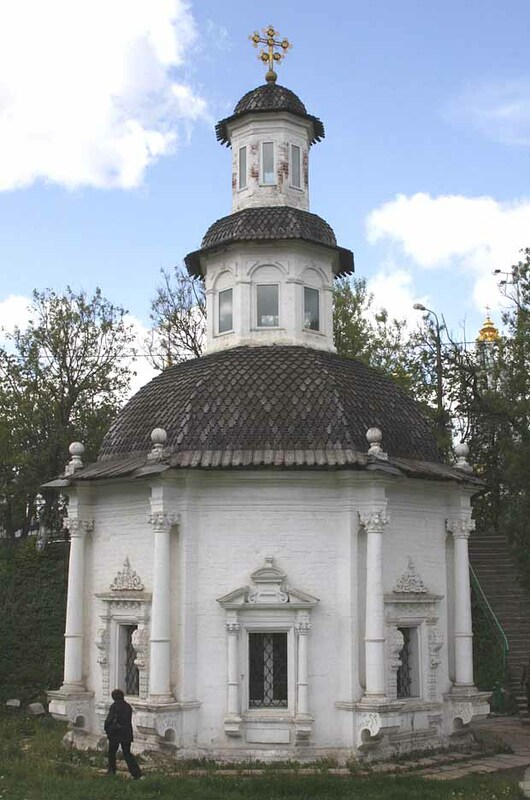 This small chapel is situated just outside of the walls of the Troitse-Sergiyeva Lavra in the town of Sergiyev Posad. 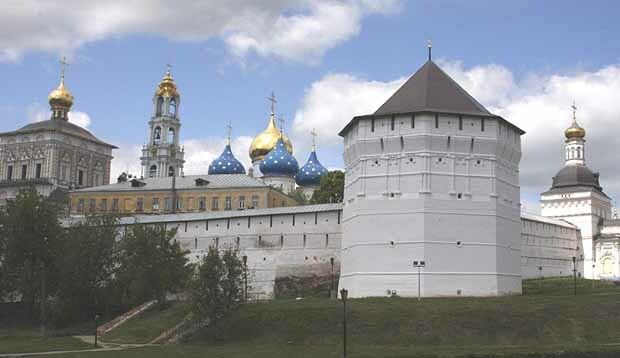 The Troitse-Sergiyeva Lavra was established in the fourteenth century by Saint Sergius of Radonezh and is one of the most important Russian Orthodox monasteries in all of Russia. Because of the religious significance of the name, the Soviet leadership changed the name of the town to Zagorsk in 1930 in memory of Vladimir Zagorsky, an important revolutionary figure. In 1991 the name was changed back to Sergiyev Posad, but both names are still in use. The monastery is also known as the Holy Trinity Monastery. 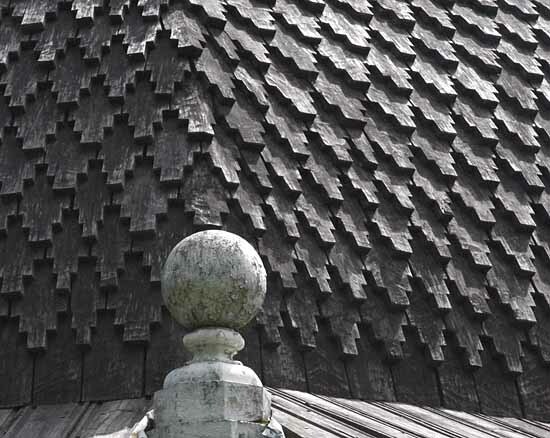 This monastery was founded in 1345 when Sergius of Radonezh built a small wooden church in honor of the Holy Trinity. Over the next decade he became increasingly influential and began attracting followers. By 1355, several other buildings had been added to support the monks who congregated around him. A small settlement (posad) grew up nearby that was called Sergiyev Posad. 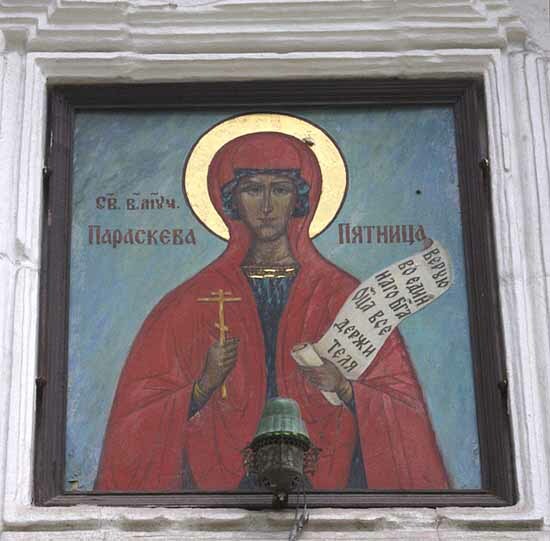 In the fourteenth century, the Russian church was still governed by the Byzantine Church in Constantinople and it was Patriarch Philotheus of Constantinople who chartered the Holy Trinity Monastery under Sergius. On September 8, 1380, after receiving Sergius' blessing, Prince Dimitry Donskoi of Moscow succeeded in defeating the army of the Tartar Khan Mamai at Kulikovo. It was the first time that Russian arms had prevailed over the Mongol Horde. After that victory, Moscow Princes became the patrons of the monastery. Sergius was offered the position of Metropolitan of Moscow and All Russia, but he declined saying that he preferred to remain in the Holy Trinity Monastery as a monk. Sergius died on September 25, 1392.